Me and avocado, me and dip? Like a strange thing right? Me, the typical Malaysian who is mostly showcasing our local sambal dip (Sambal Belacan) or Indian style chutney (Indian Mango Chutney), and all of a sudden, you actually see a dip made from Avocado in this precious space of mine? Honestly, to tell you the truth, maybe you already know it as well, me settling for our local produce and for a change, I decided I will pay for Avocado. To say Avocado is pricey, I am not really sure. RM5.00 for a single avocado? What do you think? I suppose once a while paying a bit more for ingredients, especially for an imported ingredient should be a fair deal right? Right. Back home with the single avocado, and already by then I had visualized a dip, this Creamy Avocado Yogurt Dip (Creamy Mushroom Soup & Creamy Coconut Lentil Curry) came into our food picture. Yogurt of course as you know is one of my favourite ingredients (Cucumber Yogurt Salad) and yogurt pulsed alongside avocado, mint leaves, olive oil, salt and pepper for this Creamy Avocado Yogurt Dip, served with fresh salad (Asian Watermelon Salad) and crackers. Platter food (Gado Gado). 1 medium size avocado - remove skin and seed and diced. Add all the ingredients for the dip into the processor/blend. Pulse till smooth and creamy. Gently mix up the ingredients for the salad with a pinch of salt. Serve with the dip and some crackers. Ohh those self-indulgent people!! Phew, cannot be near them and cannot avoid them either. 1)Allow the braggers to impress those who will be impressed. 2)Success is about being humble and simple. About the food: I love the peachy green color of the dip, I'm sure it tasted yum!!! Very colorful palette. looks so fresh and deliciously enticing...mouthwatering stuff! Boastful people are a BIG turn off.. It's annoying listening to them.. Most of the time, I don't even say anything and just stare at the person talking. And just nod in the end. You cannot argue with them.. Most of the time I feel if they ever think about somebody else except for themselves.. Better to avoid such people.. I can imagine Nava what it is to meet people like this. Well ignorance is bliss. What a vibrant salad and cool dip...the pic itself made me feel fresh!!! Very healthy dip.. Avocado and mint both are my favourites.. I am going to try it..
We learned in the life which hands v want to hold n which to shake. I learned it very hard way. I am all for dressing, I might crush one jalapeno in it too. Oh yes, after heavy party food you need to give rest to your stomach with cool crisp salad and what a great idea to serve avocado dip with it.an, with mint it sounds quite fantastic. I love avocado, I know it's pretty expensive here. But we get these fruits very cheap in Sri Lanka. Lovely dip for crackers. 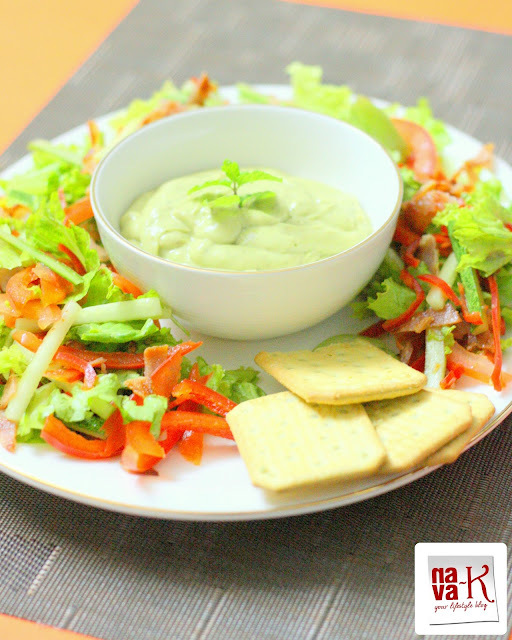 what a vibrant colorful salad..always love avocado dishes..they are my best friend..
Great blog.. I love salads, im trying this for sure..
Those kind of people make me want to scream! Ugh, pretentiousness is such a horrible quality! That looks very healthy. I should include it in my diet plan. I sooo want to try this creamy dip...Looks delicious..
Hi Nava, oh my.... this look so refreshing and appetizing. Lovely colour, great for light lunch. Thanks for sharing the recipe. Healthy & refreshing salad.Looks very yummy.But being a vegetarian i can't have it. I so agree with you Nava. In life we meet with all kinds of people. While there exists some artificial ones, the world is full of good people too. The dip looks amazing. And the salad, healthy & refreshing...just what you want after days of eating at gatherings and functions. 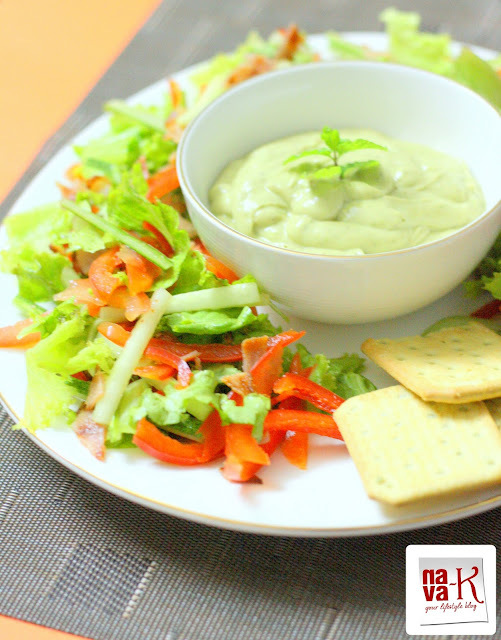 Delicious dip with fresh salad...looks so yumm dear ! !